Keep your simmer and sizzle contained with this silicone splatter guard. Frywall lets you sauté, fry, and marinate at high temperatures without spattering your counters and walls. Its soft silicone fits snugly in 12” pots and pans, and is angled to let you access the food as you cook. Stick it in the dishwasher to clean, and fold it up to store. Fits pans with inside rim diameters of 11.5" - 12.25"
Dimensions: 17" diameter x 6.5"
I love the splatter guard have it in two sizes clean up is a breeze when used and it’s easy to clean. Great kitchen tool. Makes searing almost mess-free! Love it. 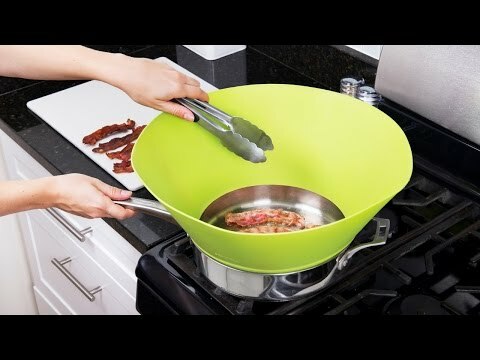 This is such a smart solution to splatter on the stove when frying food. Clean up is now so easy! Works just like it says. Keeps my stovetop clean. Keep the counter tidy and the path straight—from the pan to your plate.